The result was a crude oil export boom as American oil became less expensive for buyers around the world. The U.S. exported an average of 1.7 million barrels per day in October, a monthly record high, and more than twice as high as August levels. U.S. crude exports to Asia accounted for 35 percent of the total in the first eight months of 2017, a figure that grew to 40 percent in September and October, according to the EIA. China, in particular, started buying up large volumes of U.S. oil in 2017. That will make it difficult for U.S. crude exports to rise from current levels, although the disparity is still large enough to support about 1 mb/d of exports, according to Matt Smith of ClipperData. “If we start to see those exports dropping off, that will only cause the spread to widen again because production is only going in one direction, which is up,” he told CNBC. 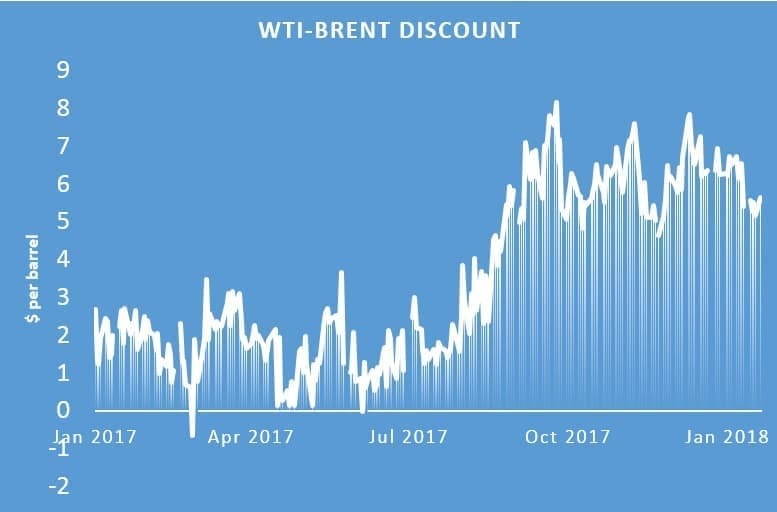 There is a moderating effect at work with the price differentials — a glut pushes WTI down, leading to higher exports and a narrowing of the spread, while a narrowing of the spread cuts down on exports, which opens up the discount once again.